American democracy is at a crossroads. To deliver on the promise of a representative, inclusive democracy, our electoral system must provide every American the opportunity to meaningfully participate and make their voice heard in our democracy. That starts by guaranteeing that every eligible person has the ability to register and cast a ballot that is counted. However, more than a decade of attacks on voting rights and democratic participation have undermined these core principles of representative democracy and have eroded the political participation of ordinary citizens and the Rising American Electorate. While these attacks are part of a longstanding conservative agenda to restrict access to the ballot and blunt the political power of communities of color, the Trump administration has further emboldened efforts to limit democratic participation. Shortly after taking office, Trump launched the “Presidential Advisory Commission on Election Integrity” to vindicate his widely-rebuked and self-serving lie that he lost the national popular vote in the 2016 election because of more than three million people who he claimed (without evidence) “voted illegally.” Since the election, there has also been an acceleration of proposed state voter restrictions including new voter ID laws, restrictions on early voting, and attempts to purge voter registration rolls. In the face of attacks at the state and federal level, protecting and strengthening our democracy and voter participation must be a local imperative. With a majority of the US population living in cities and urban counties, local proactive reforms have the potential to expand access to voter registration and voting for millions of people. Moreover, reforms that expand voter registration at the local level are crucial for increasing voter turnout and for extending the geographic reach of proactive voting reforms to reduce barriers to registration nationwide. Expanding access to voter registration is also particularly important for ensuring representation of low-income communities, communities of color, and young people. Families with annual incomes below $30,000, voters of color, and naturalized citizens, have lower voter registration and voting rates compared to their counterparts. Young people are also less likely to be registered and less likely to turn out to vote. 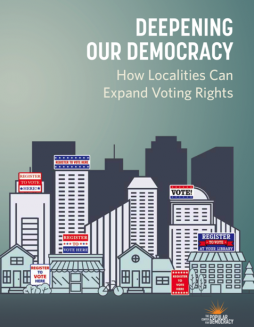 This report suggest some of the strongest measures localities can take on their own to expand voter registration to eligible people in their communities.